Training on one of the many ranges at Gunsite in Paulden, Az. I have to take exception to the oft-quoted bromide, “the first rule of gunfighting is to have a gun.” That really only works if a person already knows how to run a handgun. It also implies, especially to the newbie, that merely having a gun will stop a criminal attack from occurring. Now, I am an optimist, but that is just a bit more optimism than I can handle. The simple fact is that, before we can learn to successfully fight with a handgun, we must first learn how to successfully shoot a handgun, because that may ultimately be what it takes to stop a criminal attack. Just about every defensive instructor of note can tell about the many times students have shown up for classes with firearms still new-in-the-box that have never been taken out of that box. It is not uncommon at all for students to show up at concealed-licensing classes with the expectation that this is a class that will teach them how to shoot, since they have never fired a handgun before. Others decide that, before taking a professional class, they will get some pointers from the local “expert” and they show up at the class with a whole bunch of bad habits that have to be unlearned. Before we can successfully learn to defend ourselves with a handgun, we must first learn how to shoot that handgun accurately. 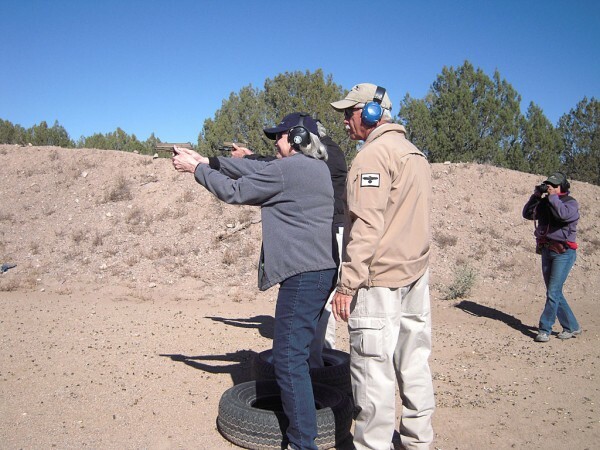 What the beginner needs, first, is training in basic handgun marksmanship. He or she needs to understand the importance of a proper sight picture, breath control, and the trigger press. Due attention to these skills is important whether we are target shooting, handgun hunting or fighting for our lives in a criminal attack. These are the areas that must be mastered if a person expects to put a bullet exactly where it needs to go. In some disciplines, we may modify these skills, slightly, and we might compress the time that it takes to perform them, but the principles remain the same. The proper sight picture for a handgun is to have the top of the front sight level with the top of the rear sight and centered in the rear-sight opening. This should deliver our shots to the spot on the target that we intend to hit. We have to understand this basic marksmanship technique before we can understand the Flash Sight Picture that is used in defensive shooting at close range— through practice, the pistol is level as we present it toward the target and we focus on the front sight only as we break our shot. In this manner, the marksman’s sight picture becomes the foundation upon which the flash sight picture is based. A person cannot breathe and shoot accurately at the same time. Breathing while trying to deliver a shot generally causes the hits to go all over the target, or even miss completely. In marksmanship classes, one learns to inhale and then exhale, holding breath as the shot breaks. In stressful situations, people tend to hold their breath, thus robbing their body of the much-needed oxygen. The trained shooter will have a much better idea of how to control breathing and get accurate shots off on the target. Perfecting the trigger press is as important in defensive shooting as it is in basic marksmanship. When we jerk the trigger, we move the sights and the muzzle, causing our shots to go just about everywhere except where we intended for them to go. When we press the trigger gently, the resultant shot almost comes as a surprise to us. More importantly, it allows the muzzle to stay on target and the shot to hit where we wanted it to. With practice and training, the shooter learns to do this much more quickly than the target shooter does, but the results are still the same. However, the time that it takes to be proficient can be compressed. The new shooter should begin the quest for perfection by first taking a basic handgun marksmanship class. The National Rifle Association is famous for creating just such a class and it is taught all across the country by NRA-certified instructors. Once the shooter has perfected basic handgun skills, a defensive-shooting class with a professional school can be booked. With this good foundation, the student will be able to further develop defensive handgun skills. In short, they’ll get a lot more out of an advanced shooting class if they start slowly and work carefully toward that goal. This article was first published in Shooting Illustrated. This entry was posted in Concealed Carry, Personal Defense, Training and tagged combat mindset, gunsite, shooting illustrated, sight picture. Bookmark the permalink.